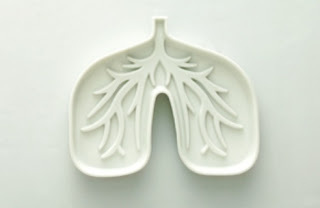 The main function of the Lung meridian is to intake Qi (pronounced chi or ki) known as Life Force Energy. The Lung meridian is the meeting place of Gu Qi (energy from food) and Ta Qi (energy from breath) These form Zong Qi (Gathering Qi). The Lung meridian also Governs Respiration by taking in Ta Qi as air and eliminating “dirty Qi” (ie. CO2). The Lung meridian is also the House for the Corporeal Soul - The Po. This is considered the spirit of the Here and Now. If there is a feeling of loss of connection with your physical body, sensations and movements - a loss of connection to your pulse of life - the Lung meridian may be a great place to start with holistic help. Interestingly enough, I myself have a chest cold. I was just sitting here, writing this entry, coughing, wheezing, and clutching my cup of tea like me life depends on it. The Lung connection literally just hit me going through these signs and symptoms. I have been feeling detached physically, not really feeling in the here and now. It’s incredible to me, how all things are connected. It’s something that has really solidified in my mind while going through these Shiatsu courses. Not only does it help to understand what is going on physically and emotionally within yourself, but it can also help you understand others. What might be going on with them as a whole, causing them to act a certain way. Shiatsu points are found with the use of a "Living Inch" - A cun. A single cun is the width of the thumb on your body. So each person has a slightly different measurement of their cun. LU-1 - “Central Treasury.” Located between the first and second rib, 6 cun from your midline. LU-5 - “Cubit Marsh” Located on the lateral side of the arm, at the end crease when flexing they elbow.